We want to help give you optimum process results that meet and exceed industry standards. Partnering with us, we will provide you a custom solution based on your type of natural or synthetic rubber and thermoplastic production. 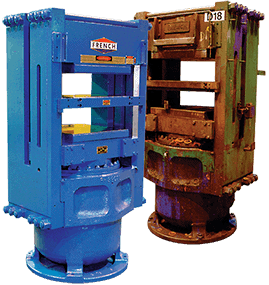 French supplies a full line of mechanical presses and systems for three different dewatering and drying processes based on your specific type of production needs. We want to provide you with the most accurate quote based on your polymer equipment requirements. Please provide us a brief description of the items you will be producing and the materials to be used. If you have more than one file or document you'd like to submit, please email us.